You will learn that with us! 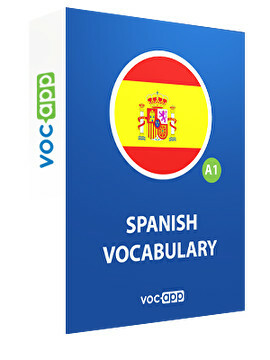 Learn Spanish words easily and quickly with VocApp. This course includes all the spanish words you may need to achieve Spanish A1 . Study Spanish nouns, verbs and adjectives and improve your Spanish language skills. Do you want to improve your Spanish vocabulary? Thinking about learning new Spanish words? Access our course to achieve Spanish A1 vocabulary quickly and esily, get ready to your language proficiency exam or simply broaden your vocabulary and learn Spanish nouns and verbs. Forget about the dictionary. With our flashcards you'll be able to quickly conquer A1 Spanish vocabulary and become more proficient and fluent. Say exactly what you want to say by learning more useful Spanish words . Speak like a native with our course! Do you want to be fluent in Spanish and express your thoughts and ideas with ease? Try our Spanish vocabulary flashcards and achieve your language goals. In this course you will find Spanish nouns, verbs and adjectives, which will help you to learn and master advanced Spanish vocabulary. Get ready to a language proficiency tests or to travels with VocApp!